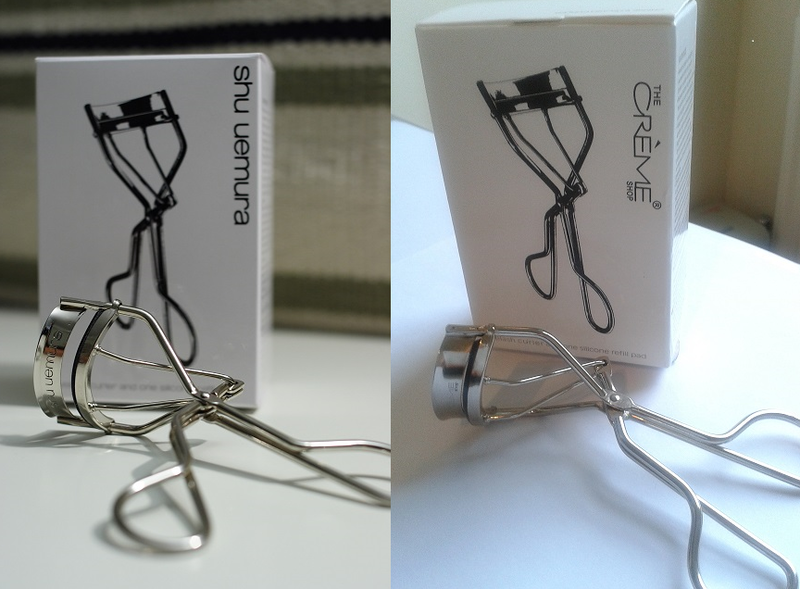 The Crème Shop Eyelash Curler – a £3.99 Shu Uemura Dupe? For years I’ve been promising to treat myself to a set of Shu Uemura eyelash curlers. The iconic lash preening tool has won a ton of awards and is a beauty editor’s favourite the world over. I’m constantly being told that no other curler shapes up the same. But with an RRP of £20 (can find cheaper if you shop around) it is comparatively expensive, and before I’ve gotten around to buying myself a set I’ve been seduced by the price tag of a cheaper model. Sadly, my attempts at bagging myself a bargain has always ended in tears, often quite literally! I’ve lost count of the number of times I’ve caught myself squealing “ouch" at a new curler for pinching my eyelid. At other times I’ll be moaning that it has given me weird looking lashes that bend upwards at a 90 degree angle. Then a few months ago, as I was rummaging through the aisles in TK Maxx, I stumbled across this set pictured from The Crème Shop. Now, you might think, given my history, that I wouldn’t be tempted to buy them, even with the £3.99 price tag. But there was something very different about this set. First, it was the packaging that struck me. The box was a dead ringer (is it not) for the Shu Uemura box. The only real difference I could see was the brand name. When I opened the pack and took the curler out to have a closer look, I was even more struck. The shape looked pretty similar, as did the rounded silicon rubber pad. 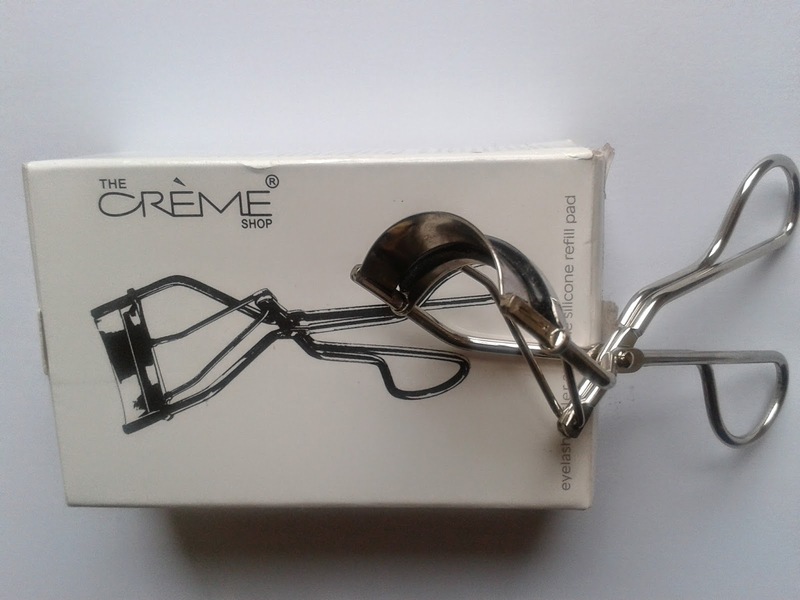 The Crème box read,” The exclusive design of the Crème eyelash curler results in a uniquely curved implement… its rounded silicone rubber pad allows for the appropriate amount of pressure to curl lashes naturally, without crimping or bending.” Result! Quick rush to the cash till and I’m out of the shop before you can say ‘Shu Uemura’ (actually, that’s not quite true – have you ever NOT had to queue to pay in TK Maxx?!) Once home, I was desperate to taste the Crème! As I have never used Shu Uemura I can’t say how the two brands compare at curling lashes. But what I do know, is that the Crème eyelash curler is the best I have EVER used. Full stop. No pinching, no pulling, no bending or crimping of my lashes. I have been quite wowed by how it performs! You use it as you would any other curler. Simply, open the handles and centre the upper lashes between the curler’s upper frame and pad. Place the curler at the base of the lash line, close to the skin, and press down very gently. Hold for a few seconds and then release. Repeat if you want more curl. After years of fruitless purchasing, I have finally gotten my hands on a decent set of eyelash curlers. Of course, if you add up the money I’ve wasted over the years on buying cheap imitations, I guess I could have bought myself several sets of the Shu Uemura curlers by now. Hindsight is a wonderful thing! The Crème Shop eyelash curler cost me £3.99 at TK Maxx. The Shu Uemura cost £20 here. Strangely, I can’t track the Crème ones down anywhere online. The Crème Shop is longer selling them it seems. I suspect they may be a discontinued line or are perhaps being relaunched. If anyone knows, please let me know and I’ll update the post. Thanks! * Shu Uemura pic credit: Ookikioo. I have always been scared to use eyelash curlers, not sure why. But I would like mine to look bigger. I am way too terrified of eyelash curlers - these look good though. That comparison is wonderful, though, look how beautiful your lashes look on the left! That Crème Shop eyelash curler you got at 3,99 certainly was a bargain! I use Eye & Mighty myself which I got from http://amzn.to/1sErQmf but I don’t think it was priced that low!